Excitement is building yet again ahead of what is the biggest day in local primary school football. The Doherty Cup final is the pinnacle for young footballers in this area. Coleraine Showgrounds is always packed to the rafters with supporters from both teams getting behind their young players and creating an atmosphere to remember. This year Coleraine school Millburn will take on Ballymoney’s Leaney Primary School on Tuesday 17th May. It completes a hat-trick of finals for the boys in maroon, who have faced St Colum’s in the last two. Teacher in charge of the team, Ruairi McClean, told Times Sport he was very proud of what the boys have achieved. “Millburn PS has a very proud tradition when it comes to the Doherty Cup,” he said. “To reach the final again this year, our third final in a row, is a fantastic achievement for all involved. Doherty Cup Final day is one of the highlights in the school calendar year and the excitement continues to grow! “We have quite a few players who have previous experience of playing in a Doherty Cup Final with seven of them being part of last year’s squad. “Life is all about experiences and the Millburn footballers won’t have many better experiences than playing in a Doherty Cup Final - at Millburn PS we try to give our children as many different positive experiences as possible! The boys can’t wait to show off their talents on the main pitch at the Showgrounds. 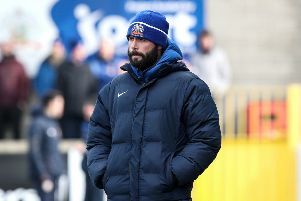 “Many of them are huge Coleraine FC fans so it is exciting for them to get the opportunity to switch roles and instead of spectating at the Showgrounds, they now get the opportunity to play on the pitch and be cheered on! “As a coach I’ve been delighted with the development of the Millburn team both individually and collectively. “Our season has been a very consistent one so far and the team has certainly developed well as the season has gone on. We reached the final of the Mullan Cup 5-a-side competition and finished runners up while we recently won the Killowen Cup 7-a-side competition. Mr McClean is now counting down the days until the final and he hopes the general public come out and share the excitment of the schools taking part. “There is a real buzz about the school now,” he said. “I don’t know who is more excited, the staff or the children. It is always a very proud day for the schools competing and this year will be no different. At Millburn we have extremely supportive parents who encourage and support the children at whatever it is they are doing. “Last year’s crowd at the Doherty Cup Final was the largest that I can remember from the five finals that I have been involved in.